Thomas Kinkade paintings featuring floral gardens are among his most popular collectables. 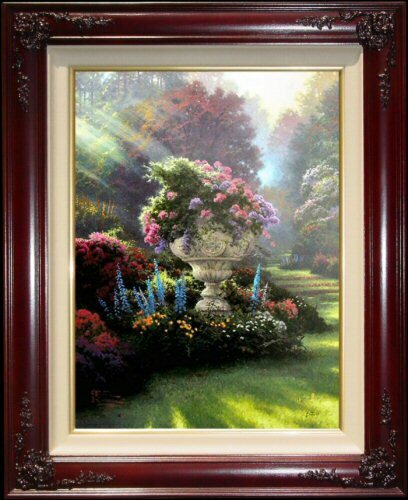 ++++ Brass Plaque with the legend "Garden of Hope ~~ Thomas Kinkade"
"Hope is the great gift of a loving God. For people of faith, hope is symbolized in the dawning of each day, the assurance that God’s love is new every morning. Hope lights our spirit in the midst of despair; it is the life force that 'through the green stem drives the flower;' it keeps a divine vision alive in the hearts of the weak and needy. In The Garden of Hope, second in my Gardens of Light collection, I celebrate the bountiful blessing that is a hopeful spirit. Radiance bathes a garden in the woods, pouring down in a flood of light upon an ancient stone urn that is, in its carvings, a vessel of hope. The deeply mysterious relationship between hope and sacrifice is expressed in the symbolism of the urn. Central is the Roman cross, bearing the inscription INRI - Latin for Jesus of Nazareth, King of the Jews - which was carved above the original cross by Pilate. On the left arm of the cross is the serene visage of Mary, mother of God. And on the right, Jesus himself, in his gentle countenance, confers his blessing on the garden and its visitors. 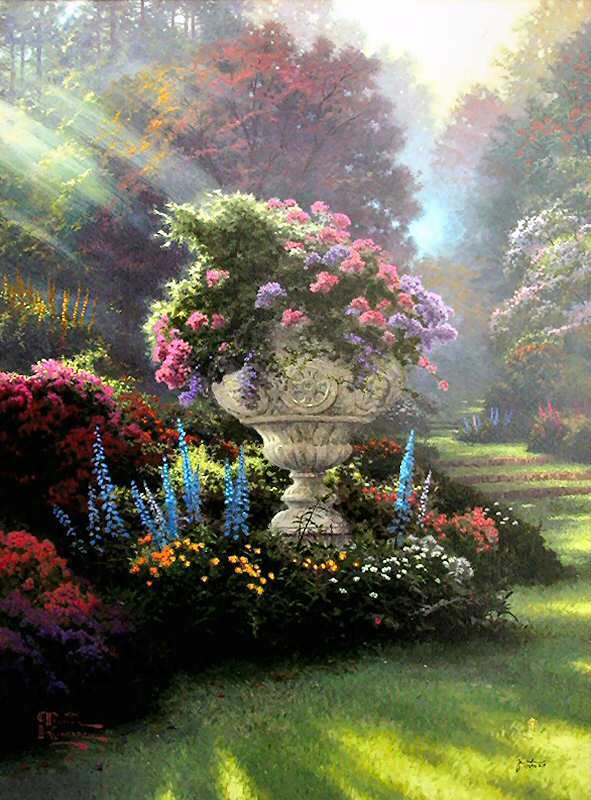 A magnificent spray of flowers burst forth from the urn in a splendid celebration of the good news. Surely, The Garden of Hope is a garden lavish with new beginnings." *Plus $65.00 for very secure packaging materials and shipping within the lower 48 States.